Bring the Thermo Scientific™ Nicolet™ iS™5 FT-IR Spectrometer where you need answers most — from your busy laboratory to the production floor to the warehouse. 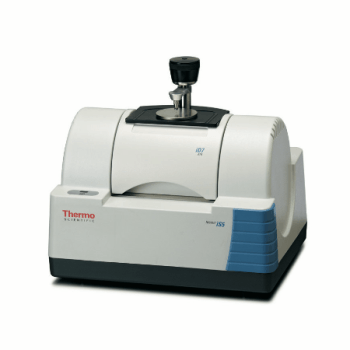 Combining compact size, affordable price and superior performance, the Thermo Scientific™ Nicolet iS5 FT-IR Spectrometer offers the perfect performance, fit and value for an entry-level spectrometer. It is the ideal spectrometer for product assurance testing and material identification for industrial, government and academic labs around the world. Incorporating flexible sample handling, lightweight design (13.5 x 10.9 in. (35x 28cm) and 22 lb. (10kg)), and industry-leading Thermo Scientific™ OMNIC™ software, the Nicolet iS5 FT-IR Spectrometer uses the same field-proven FT-IR technology found on other Thermo Scientific Nicolet FT-IR spectrometer models. The Nicolet iS5 FT-IR Spectrometer is designed to provide trouble-free operation in the most challenging environments. Replacing the IR source or desiccant in your spectrometer does not require a service call or even opening up the instrument. Tightly sealed to resist ambient humidity. Combining compact size, affordable price and superior performance, the Nicolet iS5 FT-IR offers the perfect fit and value for an entry-level spectrometer.